This bold and ambitious volume argues that postcolonial historical fiction offers readers valuable resources for thinking about history and the relationship between past and present. It shows how the genre's treatment of colonialism illustrates continuities between the colonial era and our own and how the genre distils from our colonial pasts the evanescent, utopian intimations of a properly postcolonial future. Critique and Utopia in Postcolonial Historical Fiction arrives at these insights by juxtaposing novels from the Atlantic world with books from the Indian subcontinent. Attending to the links across these regions, the volume develops luminous readings of novels by Patrick Chamoiseau, J. G. Farrell, Amitav Ghosh, Marlon James, Hari Kunzru, Toni Morrison, Marlene van Niekerk, Arundhati Roy, Kamila Shamsie, and Barry Unsworth. It shows how these works not only transform our understanding of the colonial past and the futures that might issue from it, but also contribute to pressing debates in postcolonial theory—debates about the politics of literary forms, the links between cycles of capital accumulation and the emergence of new genres, the meaning of 'working through' traumas in the postcolonial context, the relationship between colonial and panoptical power, the continued salience of hybridity and mimicry for the study of colonialism, and the tension between national liberation struggles and transnational forms of solidarity. 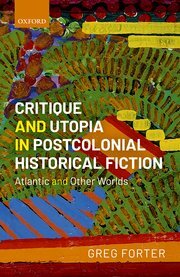 Beautifully written and meticulously theorized, Critique and Utopia in Postcolonial Historical Fiction will be of interest to students of world literature, Marxist critics, postcolonial theorists, and thinkers of the utopian. Greg Forter is Professor of English at the University of South Carolina. He is the author of two books, Murdering Masculinities: Fantasies of Gender and Violence in the American Crime Novel (New York UP, 2000) and Gender, Race, and Mourning in American Modernism (Cambridge UP, 2011). He has also published articles on American literature, modernism, psychoanalysis, gender and feminist studies, and postcolonial studies.